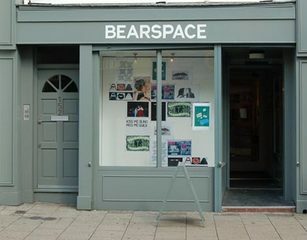 BEARSPACE is a pioneering art space in London exhibiting emerging artists who push the boundaries of contemporary art practice. Artists are selected for their response to contemporary culture and philosophy, and their work often displays a conceptual or narrative framework. Artworks pioneer innovative use of materials and rational and are of the highest technical quality. BEARSPACE prides itself on discovering exceptional artists early on in their careers, and promoting them through gallery exhibitions, art fairs, curated exhibitions and collaborations. BEARSPACE projects include large-scale exhibitions such as ‘Play’, which included work by Bob & Roberta Smith, Jake and Dinos Chapman and Anya Gallaccio; Art Fairs including Zoo Art Fair and London Art Fair; and The Deptford Art Map - a revolutionary art map for Deptford in South East London – London’s new art mecca.